India is a difficult market because most customers may not be able to articulate their impressions or feelings, but their sense of value is extremely well-developed. And substantially, the Vespa was immediately pigeonholed as an outrageously expensive, if evocative, scooter. Price corrections followed as the company took steps to ensure that sales were reasonable. Today, the Vespa is priced at ? 62,315 ex-Mumbai, still expensive  a thousand more than the Honda Aviator disc, but just over Rs 10,000 more than the Honda Activa. However, the company now claims to sell between 4- and 5,000 scooters a month, a figure they say is according to plan. Value perception and proposition aside though, the Vespa is a decent scooter overall. Its styling and image is the big pull, but the three-valve 125cc engine is also a nice unit. And Suzuki Swish/Access aside, perhaps the only scooter engine in India that operates happily at its top speed. Similarly, at our scooter track test, we found that the Vespa also handled extremely well, though the anti-dive properties of the trademark single sided suspension means a lot of adjustment has to be made on the part of the rider to use the brakes effectively. Indeed, our long term experience has shown that braking has been the weakest link for the Vespa, with the rear wheel feeling like the brakes are on-off while the front brakes are, substantially, off. The new Vespa VX aims to fix a few of these issues. In concept, it is the same scooter with upgrades. The biggest upgrade at least in function is the addition of a 200mm disc brake to the front wheel. On my short first ride the first thing I noticed is that in feel, it is like a powerful drum brake rather than a disc brake. This is a good thing because a sharp front brake and a single-sided trailing arm front suspension isn't a good mix. The brake stops the scooter effectively and generates enough force to cause a minor dive which is good for feedback. However, I do wish there was more feel. Full-on braking, the few times I tried it, required a high level of trust because there is still an overall lack of feel from the front end. 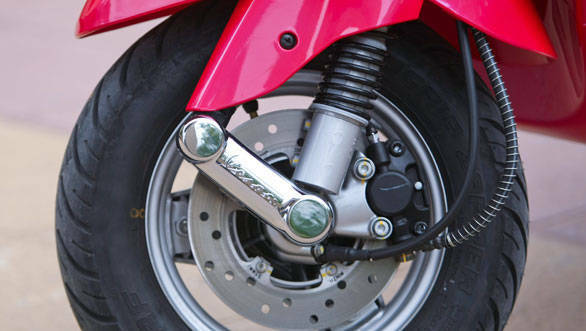 However, feedback issues aside, the Vespa now has the braking it needs and in terms of overall dynamics, the disc brake completes the package. The second big change are the tyres. The VX gets new tubeless MRF Zappers instead of the old block tread design. Vespa say they intentionally specced the base scooter with the block tread because it completed the retro image. What we know is that the block tread was a grippy tyre but it didn't fit into the premium image and price that was being quoted for the scooter. At a very basic level, premium products should have premium equipment. No one will buy a Bentley if it came, for example, with functionally excellent MRF tyres. Premium is an image that requires its own accoutrements, functionality aside. 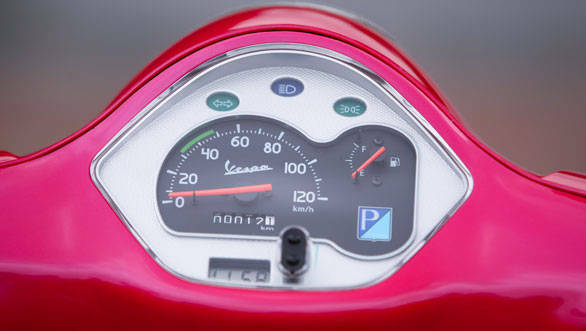 Other changes on the Vespa VX are relatively minor, including a different design of the meter console. Vespa will discontinue the sales of their black and maroon scooters because their sales have been slow  as much as 30 per cent sold so far are either yellow or red. Further, the red one will get a beige coloured seat which will be offered as an option for all the other colours. The two colours being discontinued are being replaced by the pink and blue colours you see here. 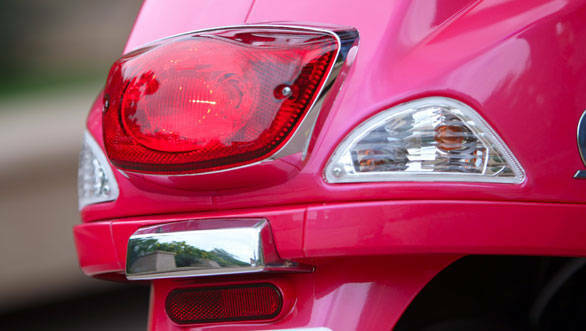 The pink is actually a two-tone shade that looks redder in some light and a lighter pink in others. Vespa says it is comfortable with the idea of the VX replacing the base Vespa entirely in the line up if that is the sales trend. However, that picture will not become clear for some time. 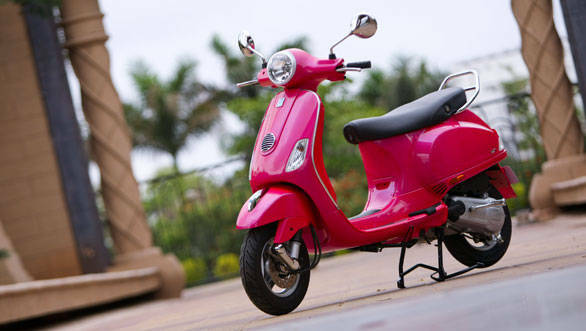 Vespa has also not announced the price of the VX yet; the actual number is expected to arrive at a launch event to be held sometime after June 20. So the question really is how much premium will Vespa want for the VX over the already expensive base scooter. We believe that Vespa should actually keep an extremely low premium - our guess is ?2,500 - over the Vespa, as been confirmed with Vespa announcing a price of Rs 65,596 ex-Mumbai to actively move base Vespa customers to the disc brake version. Between the tyres and the new brake, this is the safer scooter in daily use and has more premium aggregates than the base scooter. 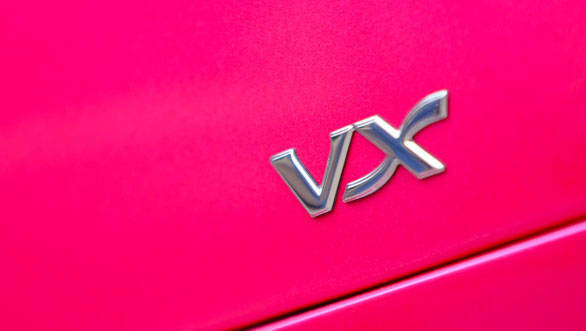 However, if Vespa take the tack that the VX has premium equipment and this must reflect in the price, then at the very minimum the price difference will be much larger, as much as ?5-7,000 over the base. This, of course, will push the price back up into the outrageous region of the price-osphere, probably not a great move.